My thirteenth ground of 2017 was on Sunday 16th April at Edge Green Street in Ashton-in-Makerfield, Greater Manchester. 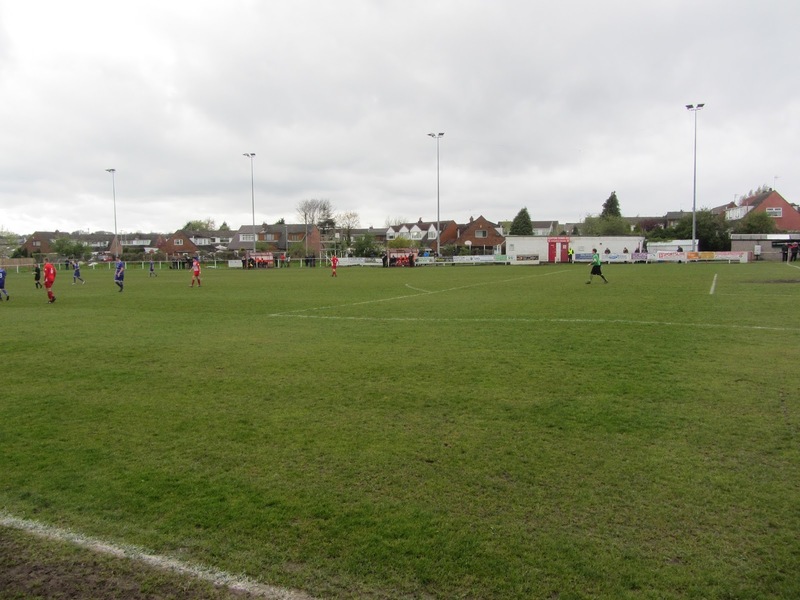 The match was Ashton Town vs. Stockport Town in North West Counties League Division One. Edge Green Street is in a residential area in the west of Ashton-in-Makerfield. It is bordered by housing on the northern, southern and western sides with a football pitch and a primary school to the east. 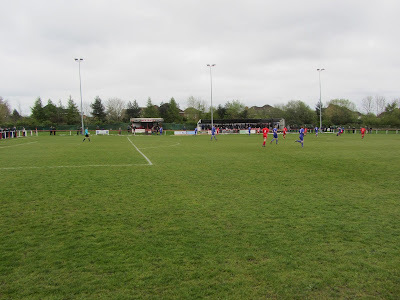 The ground is 1.5 miles south-east of Bryn railway station and has been home to the club since 1964. There are two stands on the southern side of the ground. The smaller of these is an all-seater stand towards the eastern end of the ground which has around 70 seats. The larger stand is close to the half-way line and consists of three levels of concrete. This is mostly standing though there are two rows of seating which have been bolted into the floor which adds around another 50 to the seated total. The eastern end is uncovered standing with a car parking area behind the goal. In the north-east corner by the entrance there is a club bar and food outlet. Further down the northern side there is the dressing room building which has a thin concrete viewing area in front of it. Past this building there is a decent sized grass area behind the barrier with the two dugouts and a gantry as well. The western end has a smaller grass area with netting behind the goal in light of the housing estate behind. With Ashton having only recorded five wins all season while rooted to the foot of the table it was unsurprising to see the visors start the game off better. In the 15th minute the ball was sent out to the right of the box and Ben Halfacre's shot stung the palms of the Ashton keeper. In the 26th minute a penalty was awarded to Stockport after a push on Adam Stubbs on the edge of the area. Stubbs landed awkwardly and was stretched off with the delay meaning it wasn't until the 30th minute when Halfacre stepped up and dispatched the penalty low to the keeper's right. A few minute after this the away side went close again when a crossfield ball found Alec Mudimu who saw his shot come back off the post. In first half injury time only a point blank save prevented Jamie Hinchliffe from making it 2-0. During the opening minutes of the second period the hosts had their first meaningful chance of the game when a defender flashed the ball wide from close range. 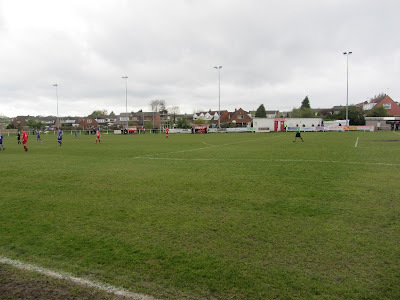 Any hope of getting back into the game was extinguished in the 57th minute though as a cross from the right found Halfacre in the area and he headed downwards past the keeper to give Stockport a two-goal lead. 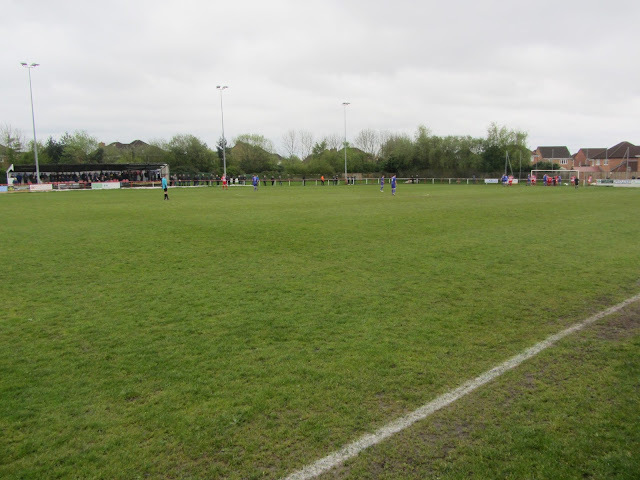 The remainder of the game was comfortable for Stockport though late injuries to Aaron Dwyer and Syrone Allen meant they had to finish the game with only nine men. Even then Ashton failed to really threaten as they went out with a whimper.